Click the button below to add the POWDERED RESTORING COMPOUND to your wish list. 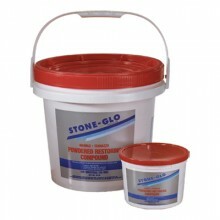 A unique blend of polishing compounds that will restore the natural polish of terrazzo and agglomerate stone surfaces. It is ideal to revive dull terrazzo and agglomerate floors, vanities,tabletops, countertops and walls. It works on surfaces that contain either marble or granite. It will repolish traffic patterns, scratches, abrasions, etch marks and even some surface stains.